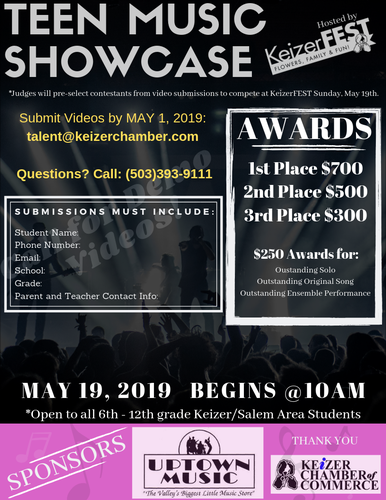 Join us at the KeizerFest Tent to enjoy performances by local Salem-Keizer School District Middle and High School Students as they compete for cash prizes in our Teen Music Showcase Sponsored by Uptown Music. Judges will pre-select contestants from video submissions to compete at KeizerFEST Sunday, May 19th. Open to all 6th-12th grade Keizer/Salem Area Students. Judges will pre-select contestants from video submissions to compete at KeizerFEST Sunday, May 19th.